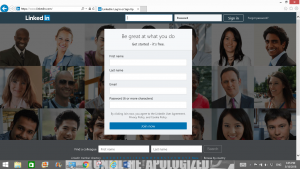 There are several reasons to create a LinkedIn account and profile. LinkedIn is a preferred site for professionals performing job searches and looking to start building their professional network. It is a good promotional tool for organizations to clients as well as future employees. Furthermore, the tool can be used to build a network of suppliers or references for your business; it is a forum to publicize all about an organization. Perhaps you are starting out in the workforce and need to build a network of contacts to help with job leads. Or you could be like me, changing careers, learning something new and exciting. Receiving an Associate’s Degree for IT Network Specialist. And currently working on an Associate’s Degree for IT Support Specialist. After a twenty plus year career in Automotive and Equipment, I am trying to start a career in Information Technology. Like many others, when I started working in the workforce, there was no Internet dependency like there is today. You could not type in a name into an electronic search engine and get several responses to pop up. Today, such simple keystrokes will bring up one’s Twitter, Facebook, Myspace accounts and LinkedIn profile. If you were an employer, there was no real way to check out a candidate without making phone calls to references or past employers. Outside of an interview, there was no way to get a feel for what the person was like or what kind of decisions they make. Fast forward to today, where the Internet is alive and full of places where people will “advertise” their lives on the world of social media. Some of these sites include Facebook, Twitter, Snap Chat, My Space, and LinkedIn, to mention a few. All have functionality to allow individuals to post parts of their lives for others to see. Any person viewing can put together a picture of another person’s life. A pattern of things they like and like to do, from posted pictures, will be evident as well as who they like to be around. From an employer stand point, this is like the “Golden Ticket”; they no longer have an immediate need to place a great many phone calls for character references, trying to guess what kind of person the candidate is. Employers can use Google search to find a potential employee’s social media sites. Such public access allows a potential employer to peek at that candidate’s world. Social media postings provide an employer a good perspective of who and what we are. One key media site, called LinkedIn, is based with the professional in mind. LinkedIn is meant to help people obtain jobs with a positive employer. For an employer, LinkedIn is a screening tool; they can research candidates including selected skills, certifications, licenses, or abilities. A potential employer is guaranteed to check out your Linked in profile once you have created one. This will be important if you are changing careers, such as I am currently doing. If job experience is light, you can compensate by listing relevant certifications and any specialized training you may have had. You will also need to keep updating these as you earn other certificates, accreditations or awards for IT Support. You can also post new technology stories or share articles of interest with others. This site has many further benefits including messaging, job notifications, and building a contact network. People in your network can endorse your skills. This is a great benefit for the employer as they can see the precise words used in an endorsement; this provides a unique opportunity to see a potential candidate from another’s viewpoint. LinkedIn allows an individual to advertise their accomplishments and skills for many to see that rather the few when replying to job postings. Following the steps to create your login is easy: put in your first and last name, e-mail address and the password you want to use for the site. Then follow the prompts from screen to screen to finish creating your profile. You are allowed the opportunity to create your own summary with is essentially your own “mission/vision statement” and then you highlight your specialties. Next comes the experience portion which is where recruiters will look to understand your specific accomplishments and talents at your respective past and current employer. Do not discount any tutoring you may have done as that highlights not only technically aptitude but the ability to work with others. It is important to illustrate you can be an individual contributor but also work on a team. The Education section provides the ability to showcase all earned degrees. Do not dismiss the Volunteer Experience section as employers are interested in understanding how a candidate exhibits giving back to the community. These sections are all free-form. Using your resume as a guide is a solid starting point but use the space to expand as needed allowing others to further understand what you bring as a potential candidate. The Accomplishment section allows certifications or accreditations to be identified. The Interests section shows to others what organizations you are following as possible future employers or just for curiosity. As an IT professional, it is imperative to showcase your talents allowing recruiters to see what you bring to an organization; highlight projects that illustrate process improvements or cost savings. It is important, when possible, to quantify the impacts of your efforts. IT professionals are a core function of every business as the world becomes more and more electronified. The next sections require you to solicit help from your network so they can solidify your position as a strong candidate. Featured Skills and Endorsements are electronic requests sent to your network to identify key skills. Recommendations are also electronic requests but require more thought and consideration as they are looking to document why you are a solid professional worthy of an organization looking for a high potential employee. Once your profile is made, you should attach a picture for your profile. 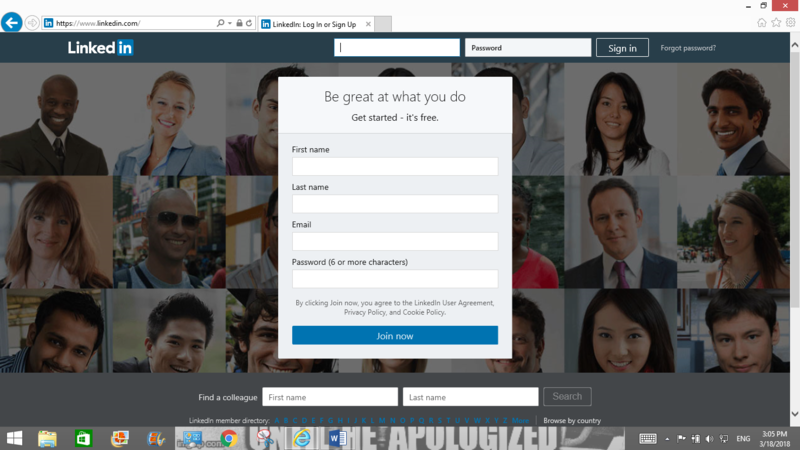 Typically a new user will be prompted to take a LinkedIn site tour. The tutorial is a great opportunity to further understand the basics and expands upon what this site offers. You can always find numerous You Tube videos to further the power of LinkedIn. Also to help you design your account more pointed to IT Support. Last but not least, look up others you know and send them invitations to connect on LinkedIn. Do not underestimate how many people will view your profile. Networking has always been a critical step in not only landing a job but looking forward in your career. Using LinkedIn is an advantage to networking as it expands your professional electronic footprint. Now that your profile is established, you are on your way to using a tool that will help you in the working world, recognized by professional and businesses from all over the world.